The Garmin Quest GPS system is pre-loaded with mapping for all of the UK. The Garmin Quest satellite navigation system features auto-routable, turn-by-turn, voice-prompted navigation with automatic off-route and detour recalculation. Garmin Quest has been discontinued. Released in 2017, the replacement and equalivent model to the Quest is the Garmin GPSMAP 276Cx. For the latest range of marine devices click here. The Garmin Quest portable GPS navigation system is a next generation GPS navigator designed to provide automatic route calculations including voice guidance, to single or multiple address destinations. Turn-by-turn instructions and detailed maps are presented on a 256-colour, high resolution, reflective TFT sunlight-readable display. In addition points of interest are transferred from the CD-ROM through a USB connection. The small, attractive design of the Garmin Quest makes for the ultimate portable, auto-navigation solution. 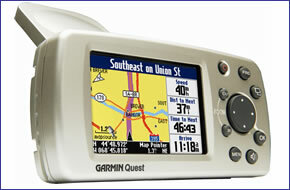 The Garmin Quest is also fully BlueChart compatible making the Quest ideal for use on both land and sea. The Garmin GPS Quest is additionally powered by a built-in Li-ion battery this makes the Garmin Quest ideal for handheld operation as well as in-car via the 12-24 volt cigarette lighter adaptor. So the Garmin Quest can be use for automotive, marine and hiking navigation. Making the Garmin Quest a truly versatile compact system. The Garmin Quest is complete with a 243 MB internal memory. The capacity of the internal memory includes all of the UK's roads. When travelling in mainland Europe, this will require transferring data from the (included) MapSource City Navigator CD-ROM. Downloadable map detail is provided using the included MapSource City Navigator CD-ROM. Maps are selected and transferred directly to the Quest through a USB connection and onto the 243 MB internal memory. The Garmin Quest also has capabilities to store up to 500 user waypoints with name and graphic symbol, allowing you to plot your route. The Garmin Quest has been designed to be a fully portable navigation system, and as such can be transferred from vehicle to vehicle with ease by the user. The Garmin Quest can be powered using the external speaker with 12-24 volt adapter cable. Built-in Li-ion batteries will allow for handheld operation. In addition the Garmin GPS Quest can also be powered by the provided mains A/C power adaptor for use in the home or office, when updating map detail or configuring a route.